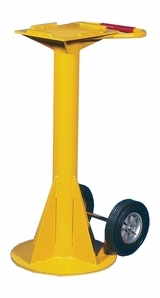 Designed as back-support to powers lifting jacks for wheel assembly removal operations. Specify height required. Use 4024-01-A oak cushion pad to reduce chance for slipping. Follow CAUTIONS listed below when using this product. • Height: maximum 50". Customer chooses height. A drawing of stand will be sent to customer for approval. All stands are custom-made and not returnable.